I absolutely LOVE Kellie, her blog and her shop, Nest of Posies (previously Bag Full of Posies). It is so fabulous and I LOVE IT!! I had this thing stuffed full and it held up perfectly. Kellie has some of the cutest things in her shop. Besides the bags that are like mine, here are just a few other cuties. So do you want to know what you will win?! Kellie is letting you pick anything from her shop! Plus, if you just can't wait to find out if you won the giveaway or perhaps, you just weren't lucky, Kellie is also giving you all a Discount Code for 15% off your purchase. Use the code: SUMMERTIME at checkout to receive your 15% discount. 4.) Blog, Tweet, or Facebook about the giveaway. Winner will be announced Friday evening and will have 48 hrs to contact me. So cute! I'd get her summer chevron bag in hot pink! Thanks for the chance to win one of these! i FOLLOW HER BLOG ALREADY! I would definitely get the made to order blog tote. LOVE that idea! I'm following Nest of Posies. Not sure why I wasn't before! Super cute blog! I love her store! Would love a Jute bag with my blog name for BlogHer! I love her 8 rosette bag. I follow your blog, Allie. I think I'd order Summer Family Bag with chevron border, rosettes and monogram in orange (but, I would prefer it in hot pink, black, and green.) Thanks for the giveaway. I like themjute bag with blog name bag or the game day bag if I could get an Ole Miss bag. I am also a follower of Nest of Posies! I would pick one of the chevron border bags with my monogram! 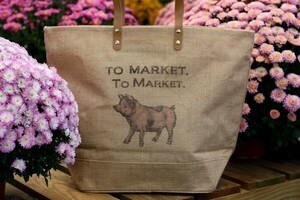 Would LOVE to have the To Market tote, or a customized one with my shop name on it!! Follower of her blog for quite some time! 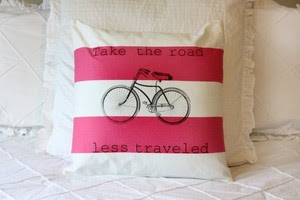 I love the bike pillow, so cute. That's what I would want! I like nest of posies fb! I am a loyal follower. It's what gets me through my work day. I like & love it. Ok step 4 down. I've FB it to everyone I know. I love the summer family bag with chevron border! I'm already a follower of Nest of Posies! And I follow Nest of Posies on FB! Love the pink scallop bag! Thanks for the giveaway! I just signed up to follow your blog...so glad I found you! I follow "Nest of Posies". I am already a follower of Nest of Posies on Facebook! 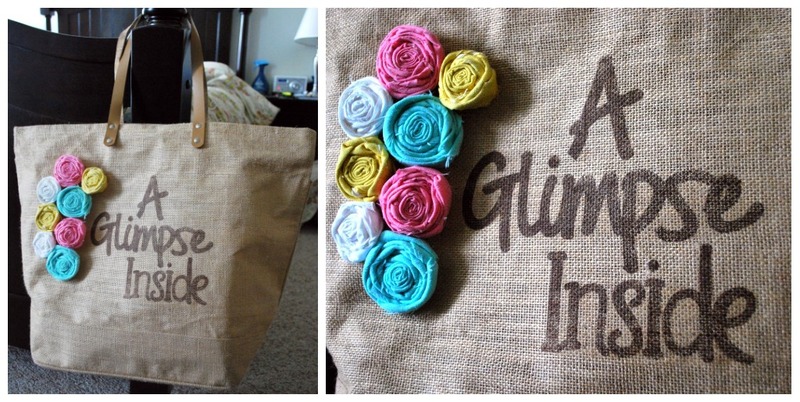 I would have Kellie make me a custom bag with my blog name and rosettes on it! Woo Hoo! Love that To Market bag, so cute! Thanks for hosting this terrific giveaway! Love the 'Eat Your Greens' Natural Jute bag. So cute! Thanks for the chance to win! Been a follower of Kellie's blog...and commented on today's blog...LOVE the Chevron Curtain! 'Like' Nest of Posies on FB! Been following (and love!) A Glimpse Inside! Thanks again for the chance to win! I would get the hot pink and white striped Sunbrella pillow with birdcage. It is adorable. Hi. I am a follower of Nest of Posies. I would love to win "Summer Family Bag with chevron border, rosettes and monogram". Super cute! I like the summer family bag or maybe a bag with my blog name on it. So cute! I like the rosette bag that you can personalize. I Slso like the quote bag you can personalize as well!!! I'm a HUGE fan of Kellie's and her Union Jack bag --- it so needs to be mine all mine! and stalk her on Facebook! I follow nest of posie's blog an left a comment!! I follow a glimpse inside's blog!! And left her a comment on her page too!! I like Summer Family Bag in Yellow (and Pink Scallop Posie Jute Bag too). I am already a fan on FB. I left a post saying I visited from A Glimpse Inside. I became a follower of A Glimpse Inside. I love the Eat Your Greens bag! I would choose the Magical Tooth Fairy Door!! AWESOME!! Definitely would have to get the same thing you got, Allison! I love the 8 Rosette made to order bag! I really want one of her awesome bags. Still undecided as to what I want on it though. If I won, I'd get the pink and chocolate leopard print posie bag. I love the Eat your Greens jute bag! I would love to have a summer family bag! I would love to win the 8 rosette made to order blog or business name bag! ooohhhh.....the Summer Family bag in orange! Thanks for the chance! I like NOP on Facebook! Wow! Right now I am in between the customized grain sack tote & the chevron tote! and, I now follow your blog! I follow Nest of Posies! I have been stalking her bags!! I so want one like yours with my blog name on it!! My friend Gina has one and I looove it (The Shabby Chic Cottage)!! I *love* the "pink scallop posie jute bag"...so stinkin cute!! The made to order 8 rosette bag...Sooo cute! I would love to get a rosettes bag with my blog name on it!! Awesome giveaway! Love Nest of Posies. I follow your blog! Yay! Fingers crossed, hoping I win! I love her stuff! 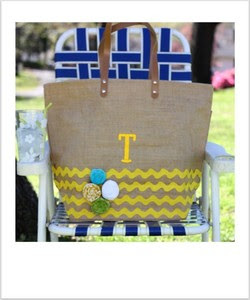 I would get the Summer Family Bag with chevron border, rosettes and monogram! Super cute!!! I would love a bag with my initials on it! I like the pink and chocolate leporad print posie bag, so cute!